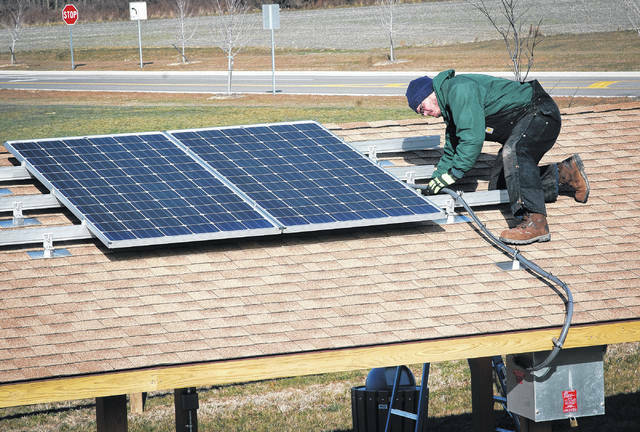 Mike Kelly, a facilities and equipment worker, inspects the solar panel on top of the Orange Bridge Park shelter house. The panel was installed just before the park opened Oct. 9, 2016. Beth Hugh, Orange Township parks director, said the panel and transformer will only power a couple of crockpots and a boombox. Hugh is talking about a small solar panel affixed to the top of the shelter at Orange Bridge Park, just off of U.S. 23. As township officials considered the construction of the park on the one-acre lot, a leftover piece from the purchase of the land for the walking bridge crossing over U.S. 23, they discovered it wasn’t close to any electric utilities. Funding for the project came from township’s park levy fund, according to Hugh. Hugh said waiting for future development to bring electricity closer was still 10 years way or the township could try solar power. Hugh said the power generated by the solar system is only limited to the shelter of the park because it doesn’t produce enough electricity to sell back to the grid. However, she said trustees have approved upgrading the current system’s transformer and battery pack to a larger one. She said at this point it would only power a couple of crockpots and a boombox at the most. Hugh said the upgrade would allow her department to switch out the shelter’s lights to the type used at the other parks. “The lights are left on at night for security reasons,” she said. Hugh said since the park is small it would at most be used for either a race start or a stopping point for someone to just enjoy the park. Hugh said there have been discussions about expanding the use of solar power to other areas and departments in the township. She said the power requirements at the other parks are greater than Orange Bridge, especially at North Orange Park where the swimming pool is located. Hugh said the township’s high demand is in the summer months. “I like taking Orange Township above and beyond,” Hugh said. This entry was tagged delaware county, ohio, Orange Township, Solar Panels. Bookmark the permalink.